Your Kindle Paperwhite allows you to borrow books. That’s right, you don’t necessarily have to buy those books. It’s not quite the same as it was before e-books, but remember the library? Many public libraries allow Kindle e-books to be checked out. How does this work? The e-book is made available to you for a fixed amount of time — the loan period varies by library. When the loan expires, the e-book is no longer available to you, unless you check it out again or purchase it from Amazon’s Kindle Store. You can make highlights, add notes, and include bookmarks in a borrowed library e-book. Those annotations are preserved even after the e-book loan expires, in case you later decide to purchase the e-book or borrow it again. To borrow e-books, go to your local public library’s website. If your library supports OverDrive digital e-book services, you can check out Kindle-compatible e-books. Note that you have to use your library card, just as you would when borrowing a print book. Public library e-books for Kindle e-readers are presently available only in the United States. From your library’s website, you can have the e-book delivered wirelessly to your Kindle through Wi-Fi. (They aren’t distributed over a 3G connection.) Note that some publishers allow books to be transferred to your Kindle Paperwhite only by using the USB cable. These books also cannot be read on other devices such as an iPhone or a PC (using the Kindle app). If you’re an Amazon Prime member, you have access to the Kindle Owners’ Lending Library. Amazon Prime is a $79-a-year subscription program that provides a number of benefits to subscribers, including free shipping on Prime-eligible products; access to the Prime video library; and for Kindle owners, the opportunity to borrow books from the Kindle Owners’ Lending Library. At the time of this writing, close to 440,000 books were available, covering topics from fiction, to humor, to travel. For an overview, go to the Kindle store on your device and open the drop-down menu for All Categories. The Kindle Owners’ Lending Library is the last item on the list. Browse the options and read the descriptions. If you find a book that intrigues you, simply tap the Borrow for Free icon to download the book immediately to your Kindle Paperwhite. You can borrow one book per month. You can’t borrow a new book until the previously borrowed book has been returned. If you aren’t eligible to borrow a book (that is, you’ve reached your monthly quota), the option to Borrow for Free appears dimmed at the Kindle Store. 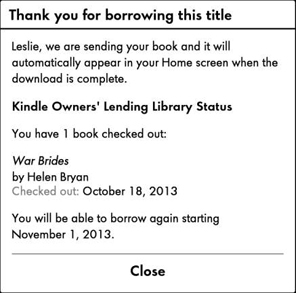 If you have a borrowed book on your Kindle Paperwhite, you’ll be asked to return the book before you can borrow another. Although you can borrow only one book per month, you can keep a book on your device for as long as you want — but you won’t be able to borrow a second book until you return the first one. Although you can see books that are available for borrowing while browsing the Kindle store using your computer, you have to use your Kindle Paperwhite to borrow a book. You can’t send a borrowed book to your Kindle Paperwhite from your computer. If you maintain a Wish List at Amazon, you can access it from your Kindle Paperwhite and see which books on your list are available for free borrowing. Tap Settings, and then swipe the list to see additional options. Your Wish List will be at the top of the list. Tap it, and then Tap Kindle Wish List. Books that are available in the Kindle Owners’ Lending Library will appear with the Prime logo.